Greetings everyone, my name is Lejla and with that I welcome you to my guest post here on Anime Decoy. Victor is a great blogger and I am so happy to be able to work with him. Besides being a huge anime and manga fan, I am also an anime/manga artist and the creator of the anime blog www.worldofanimegirl.blogspot.ba. Imagine having just a card game as source material for an action, adventure, fantasy anime you have to make. MAPPA studios took that challenge and turned a battle card game with no more source material than some conceptual artwork and with as much plot as a cardboard game can have, into a really good anime that even had potential for a masterpiece. 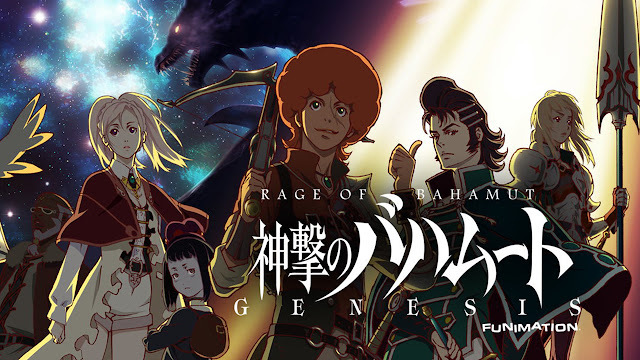 I am talking about the 2014 anime, Shingeki no Bahamut: Genesis, also known as Rage of Bahamut and here is the review to it. Enjoy! Shingeki no Bahamut is set in an alternative version of medieval France in a world where every possible fantasy creature exists. The story sets off with an old tale about the ancient dragon Bahamut that brought about destruction to the land of Mistarcia two thousand years ago. Only by working together, the gods and demons were able to save the world, sealing the dragon away and creating a key to keep him imprisoned forever. They key was split into two halves, one being kept by each deity, but the long lasting peace would again be threatened after one of the halves gets stolen. In a world that is about to face new danger we meet our two protagonists-the bounty hunters Favaro and Kaisar who, in terms of personality, couldn't be more different. The bounty haunting life that they knew would soon be over after Favaro accidently meets a mysterious woman that goes by the name Amira. The story itself sounds promising and is really intriguing but for some reason I found it rather boring in the beginning. It is in the second half where the anime finally drew my full attention to the story. The second half puts all the pieces together and you finally understand what is going on. Moreover, new plot twists and surprises are just the beginning of the excitement as the anime slowly moves towards its huge finale. Amazing battles, emotional background stories and character side stories are just some of the elements that turned Shingeki no Bahamut into a really good anime in the end. And when it comes to the first half, I would have probably dropped the anime if it weren't for that one story element-the relationship between Favaro and Kaiser. Even though the story does have its ups and downs, it is the two protagonists that actually keep your attention, especially in the beginning. The story element of two characters that hate each other, yet are obliged to work together, never gets old and in case of Shigeki no Bahamut it definitely contributes to its entertainment factor. The way their contradictory personalities interact keeps the anime amusing and always open for new surprises. What's more, an interesting background story about Favaro and Kaiser is woven into the main story as it reveals the true reason for their everlasting fight and hatred. In short, you might find the story of Shingeki no Bahamut: Genesis hard to follow in the beginning, but I promise you an entertaining and slightly emotional story full of action and amazing fights later on. If there is one thing that Shingeki no Bahamut did without a single flaw, then it is the characters. The character design is so remarkable and unique, and even though I am not a huge fan of the style I have to praise MAPPA for their outstanding work. But the thing that was even better than that was the fact that each character actually had a distinctive personality. The personalities of the main characters are of course the most noticeable ones, especially when it comes to Favaro and Kaiser. 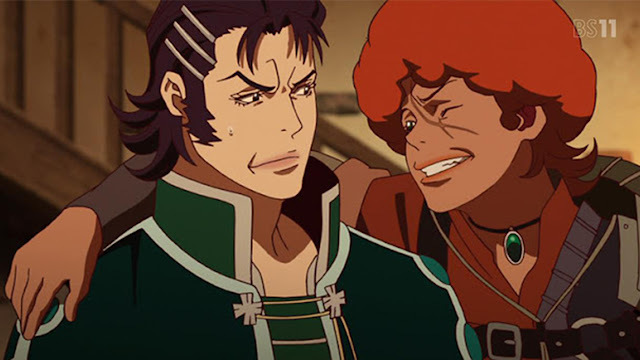 Favaro is a carefree bounty hunter that finds the purpose in life in three things alone: money, women and wine. Lies and scams are part of his everyday life whereas his life-moto would be his father's quote: „Which way is the wind blowing? To tomorrow! “. Kaiser, on the other hand, is a very serious and mature young man that also lives the life of a bounty hunter. Noble by birth, Kaiser was once a knight and so he still behaves, all according to the codex of knighthood. Amira, the leading female is a naive, sweet and rather childish young girl that is not truly aware of her powers. 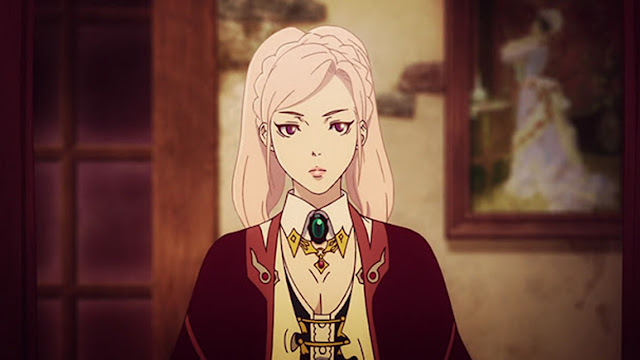 She was definitely one of my favorites form the show and it was her character design on the anime cover that drew my attention to Shingeki no Bahamut: Genesis in first place. Just as I said before, one of the greatest things about the anime is definitely its style. Both the setting and character design are amazing and more importantly distinctive among other anime. One thing I did have a problem with was the animation. All in all, it was not bad, but it lacked in contrast. The heaven scenes were too bright, the demon scenes were to dark and in some parts you just couldn't clearly see what was going on. The quality of the animation was mediocre in my opinion, but I have to say that it was still enjoyable to watch. Even though Shingeki no Bahamut: Genesis is solely based on a battle card game, the anime had potential to turn into a masterpiece. Unfortunately, it didn't come to that. The lack of excitement in the beginning and the flaws in the animation made the anime less enjoyable but it is nevertheless a really good anime that is worth your time. What saves the anime is definitely its intriguing historical-fantasy setting and the quality of the characters. Simply put, Shingeki no Bahamut might not be a masterpiece but it still deserves to be part of the completed section on your anime list. This would be it. I hope you guys liked my review on Shingeki no Bahamut: Genesis. At this point, special thanks to Victor for giving me the chance to write on his blog. Keep up the good work on your page, I am sure you'll hit it big. ABOUT THE AUTHOR: Lejla is the owner of www.worldofanimegirl.blogspot.ba who spends most of her free time watching anime, drawing and writing various anime blog posts on World of Anime Girl. Don't hesitate to contact her on Instagram under @animegirlism or @aniblogger or via mail: worldofanimegirl@gmail.com . Whether you want to discuss anime and manga related topics or you're just up for a little chat, feel free to contact her.